I want to tell you how to reinstall the latest MacOS using the built-in Recovery mode both with and without wiping Mac. First, let’s discover why you may want to reinstall MacOS or OS X. The most common cause of troubles is erratic working of your machine. Other reasons are selling your Mac to someone or giving it to family members so all the information and preferences should be wiped. You can also reinstall the system if you don’t like the latest one but your new Mac was shipped to you this way. Okay, after you have decided that your Mac needs reinstalling MacOS for whichever reason, here is a simple way to do it. We will use Apple’s built-in Recovery partition mode which is able to reinstall the latest MacOS version on your Mac. As you know, installing a system from App Store doesn’t require any disks, so they have made it possible to install the OS via the Internet with the help of the Recovery HD. Alternatively, you can create a bootable USB drive with MacOS, but this is not what we want to discuss now. 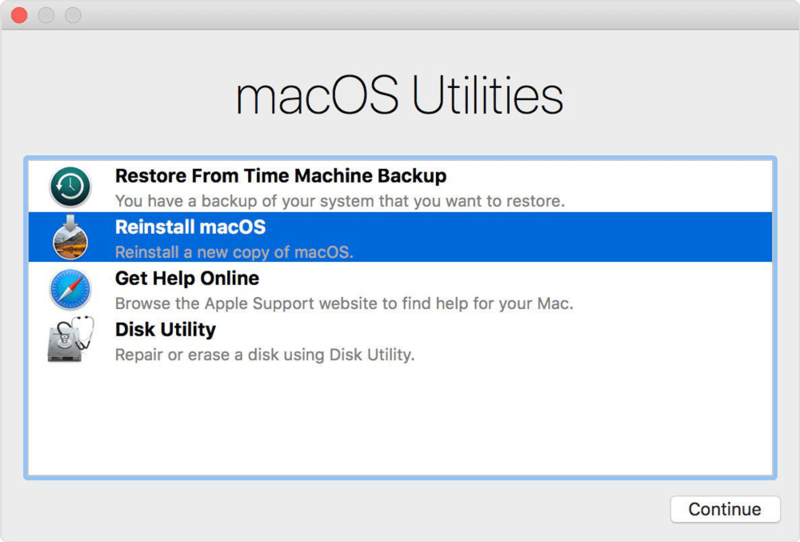 What is Necessary for Reinstalling MacOS via Recovery mode? Prior to reinstalling Mac’s system, make sure you have backed everything up. I bet you won’t be happy to see your documents disappeared after reinstalling MacOS no matter what was the purpose of doing that. Ensure that your Internet connection works well. Check whether it is secure and WEP or WPA are turned on. It is what’s ordinary present in all home Wi-Fi networks, but if you don’t want your data to leak in case you use proxy or PPPoE, it is better to think of the safety of connection. Hold down Cmd+R while starting up your Mac. You will see Apple’s logo or a spinning globe along with hearing the startup sound. This will open a MacOS Utilities for you. It will offer various options: Restore from Time Machine backup, Reinstall MacOS, Disk utility and Get help online. What follows next is deciding whether you want to wipe your Mac or save your information on it. To wipe the disk, visit Disk utility. Otherwise, head to the point #8. Select ‘Disk utility’, click on the ‘Continue’ button. Find the volume for erasing (it will be likely ‘Macintosh HD) or click on ‘View’ and ‘Show all drives’ to see the necessary volume, and select ‘Erase’. Ensure that (MacOS Extended Journaled) is the ‘Format’ and select ‘GUID partition table’ as the ‘Scheme’. Tap on ‘Erase’ and wait for a couple of minutes or even less. Go to ‘Disk utility’ and quit it. After getting back to the OS X Utilities window, click on ‘Reinstall MacOS’. You may pay attention that the Recovery mode is unavailable now due to erasing the startup volume, then you will need a bootable installation drive we were talking about previously. However, it is unlikely you will face this kind of problem. Select ‘Reinstall MacOS’ and click ‘Continue’. If your Mac requires entering your Apple ID, do that and wait until a new MacOS is installed. After everything is finished, continue to set up your Mac or pass it to a new owner and let him/her set its preferences. This was a guide on reinstalling the same MacOS version. Still, I told you that we can use the Recovery mode for installing an older MacOS version. There are some button combinations along with Cmd+R that will help you to choose an exact MacOS version compatible with your Mac. Cmd+R for installing the latest installed MacOS version on your Mac (this won’t upgrade the system but just reinstall the existing one). This option is the best when selling your Mac. Option+Cmd+R will upgrade your MacOS to the latest version compatible with the model of your device. Shift+Cmd+R works for Macs with Sierra 10.12.4 or newer and it can install the closest version to the existing one if it is still available on the App Store. As you see, the Recovery mode will help to downgrade in case your Mac was shipped with an older version. Additionally, I want to tell you how to connect to the Internet from the MacOS Recovery mode, as you will need it for reinstalling the system. Go to the Wi-Fi menu in the top right screen corner. If you have a password for your Wi-Fi, type it in. Finally, you are ready to reinstall your MacOS, so go on. I hope that this guide is helpful and you won’t have any problems.